Home » Personal Finance » How we can prevent generation of black money? 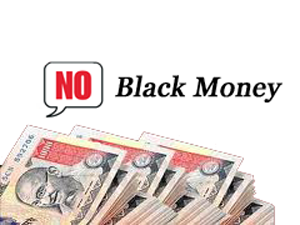 Black money it is not money with black color, it refers to money removed from the official economy (via corruption, bribery, tax evasion, etc.) and stored in terms of cash within or outside of the country. Any monetary transaction which is done in cash and not shown officially on any documents is source of generation of black money. This hidden black money has its own hidden consequences. This black money is like cancer in country’s economy if not cured in time may disturb main economy badly. You must be thinking what is relation of black money with increase in inflation, let me explain you, with use of black money one can purchase consumer goods, including food grains and stock it in big way. This will cause artificial shortage in market, due to this shortage consumer will be ready to pay more. Same way you will purchase movie ticket in black by paying more if tickets are not available. Black money is responsible for increasing income difference in society. The person who is paying his tax regularly & honestly, his income didn’t match with other person who is not paying tax. Black money is also responsible for increase in corruption as the person who has black money can offer bribe to another person for their business or for their personal work. These types of people can get everything what they want. Due to this other people who are eligible / qualified but can’t give bribe suffers a lot in getting work done. Once they are exhausted from repetitive failures they are forced to give bribe to get their work done. Hence it cause increase in corruption in the society. Every country require money for the growth and infrastructure building, Revenue collected from tax is used for building nation (infrastructure & other development), to increase arms and ammunition for defense of country and for other welfare related work. Excess of black money cause reduction in tax collection, due to lack of fund government will be either force to increase tax or to take loan from world bank. As we know black money is bad for us we must prevent generation of black money, here are some pointers in that direction. India’s population is 1.22 billon and number of PAN card holder is less than 95 million, Not only that tax payer count is only 35 million, meaning in India only 3.5 Crore people earn money which is taxable (2 lac). There are millions of businessman’s who earn money which is taxable but they don’t declare their actual income and don’t pay tax honestly. Please remember that we have to realize our moral responsibility of contributing in building our nation. Don’t contribute to black money, contribute to nation. Pay your tax honestly. Corruption is now part of life; most of black money generation takes place due to corruption. Time has come to change our tendency towards corruption. We all must say no to corruption. Most of people offer bribe for getting work done quickly. Some simple examples are giving bribery to police, when you break traffic rule or to RTO officer for getting driving license quickly. At each and every stage people are getting corrupt because of we allow them to do so. Let’s say no to corruption to prevent generation of black money. We should minimize dealing in cash as much as possible. This is best way to prevent black money circulation and generation. It will be very tough to do this, as we have habit that people ask for cash and we give money in cash (sometime to fulfill necessity). We should stop this. We will encounter challenges in implementing this at certain places, examples are reality market 50% transaction in real estate market are done in cash, another such example is donation given to school, most of school ask for donation in “CASH” not only that they don’t give any receipt of this donation. We should fight with courage towards these challenges to kill black money. Most of people I have seen do not ask for bill /invoice for the things purchase by them. For small amount it doesn’t make sense but for big amount you should ask for bill, you might not be aware that you are paying VAT and other tax on purchase of certain goods like electronics item etc, if you don’t take bill there are chances that vendor may not make this transaction as official and covert this money in black, so it is better to ask for invoice. We should generate awareness in people about what black money is and what are associated consequences of black money. Not only that we should create awareness about Tax. Government is trying hard to fight against black money we should also help. Do share this voice of wisdom against black money with your friends.